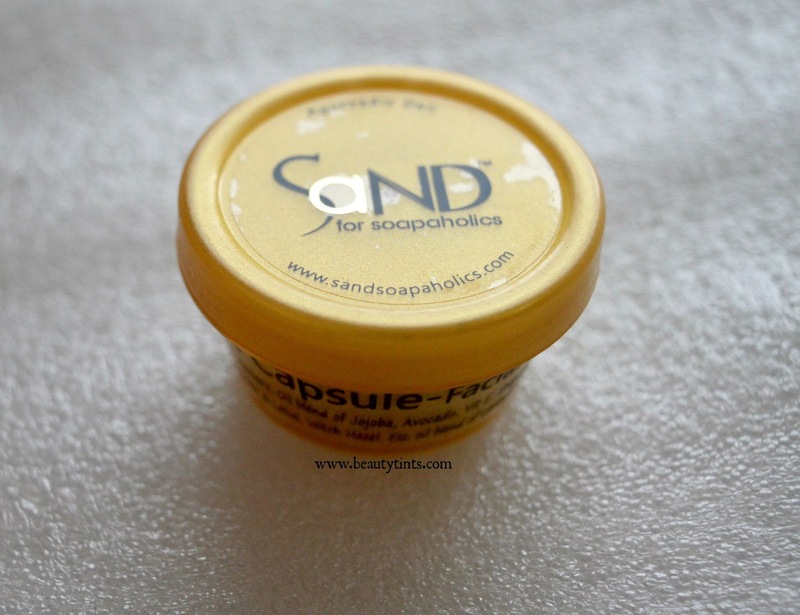 Sriz Beauty Blog: Sand for Soapaholics Time Capsule Facial Serum Review!!! Sand for Soapaholics Time Capsule Facial Serum Review!!! 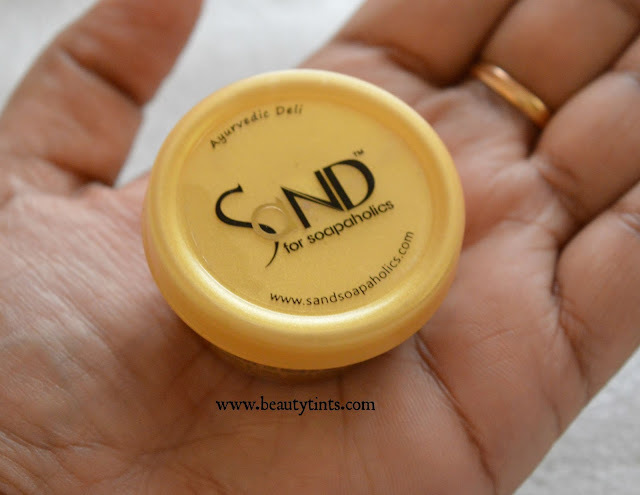 Today I am reviewing one more newly launched product from Sand for Soapaholics,which is their Time Capsule Facial Serum,which has become my must have product for my night skin care regimen. 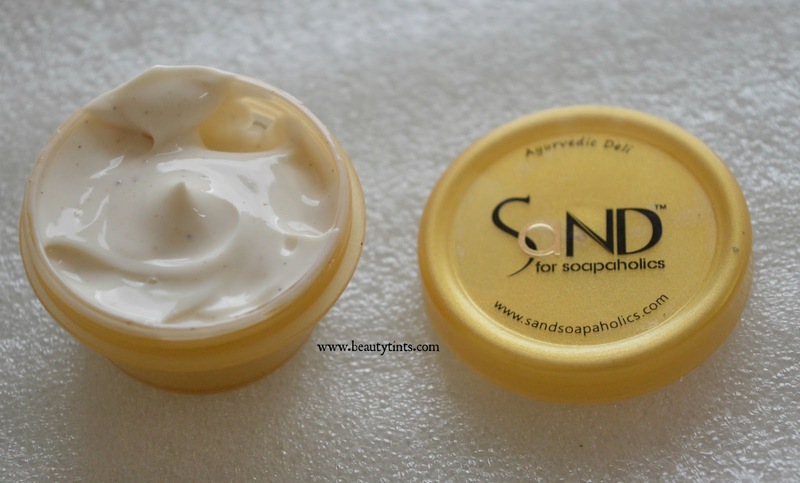 Packaging : It comes in a golden colored portable light weight plastic tub with a screw cap. 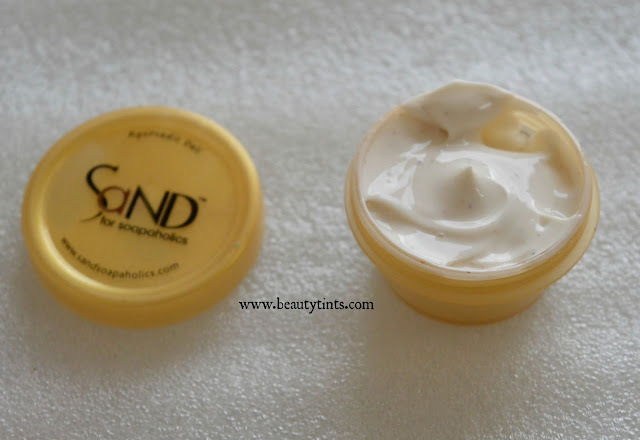 Color and Texture : This is a off white colored cream with black colored micro granular particles. What the Product Claims : Whoever said beauty doesn’t last forever, definitely hasn’t used our lovely face serum.This beautiful product takes away those telltale signs, and keeps your skin looking young. Use it any and all times – under your makeup, when you get back home after a long day out, or right before you jump into bed! 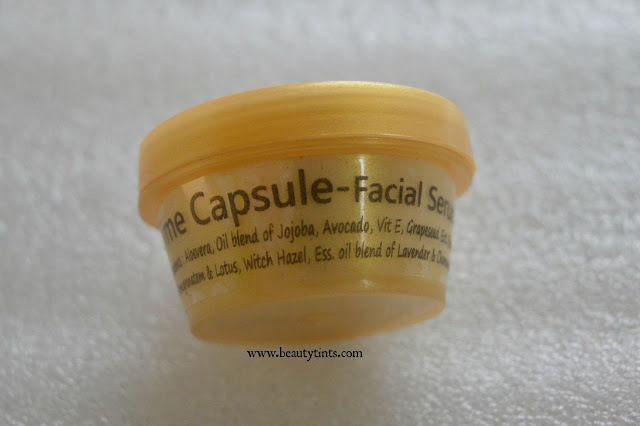 We’ve put in Jojoba Oil, Pomegranate Extract, and Nutmeg to keep your skin firm and hydrated. 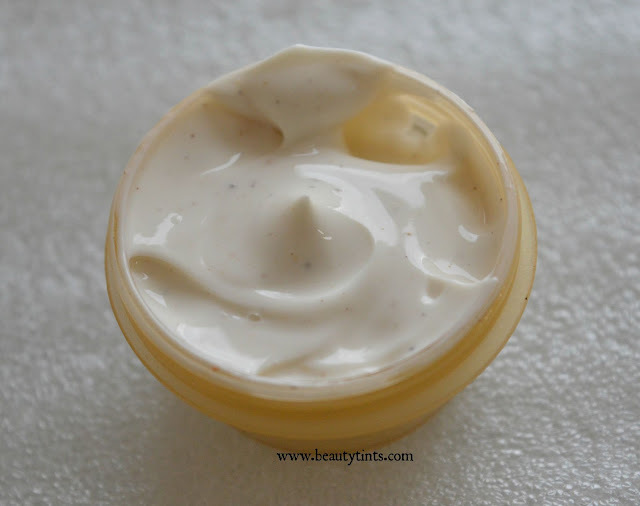 Added to that is Lavender and Chamomile Essential Oils, which are powerful anti-oxidants and help your skin heal. So don’t worry about facing the pollution of today’s lifestyle – we’ve got your back! Availability : Available in from their outlet at Garuda Mall,Phoenix mall and The forum mall,Bangalore and from their online store. My View On Product : I have been using this from past 2-3 weeks after toning my skin, just before going to bed instead of a night cream.I tried using it during the day time, but it has a bit thick consistency,which is some what heavier for the day time for my oily -combination skin and so only using it in the night.It has a wonderful mixed fragrance with a dominant chamomile fragrance with hint of lavender and nut meg.It makes my skin super hydrated,smooth and supple in the morning.It gives a visible glow and radiance to the skin and gives a refreshing feel to the skin.It is more like a cream than a serum.It gets absorbed into the skin with light massaging.It is enriched with the goodness of many effective ingredients like aloe vera gel,jojoba oil,avocado,Vitamin E,Grape seed,evening primrose,rosehip,nut meg,glycerin,essentials oils of lavender and chamomile.It is free from parabens and other harmful ingredients and is cruelty free.It is a bit pricey for the quantity,but it contains all the natural and rare ingredients,it is total worth for the price.It suits all types of skin especially dry skin!!! Final Conclusion about Sand For Soapaholics Time Capsule Facial Serum : Those who are looking for a cream/serum for pampering their skin from within in all natural way should gives this a try!! !